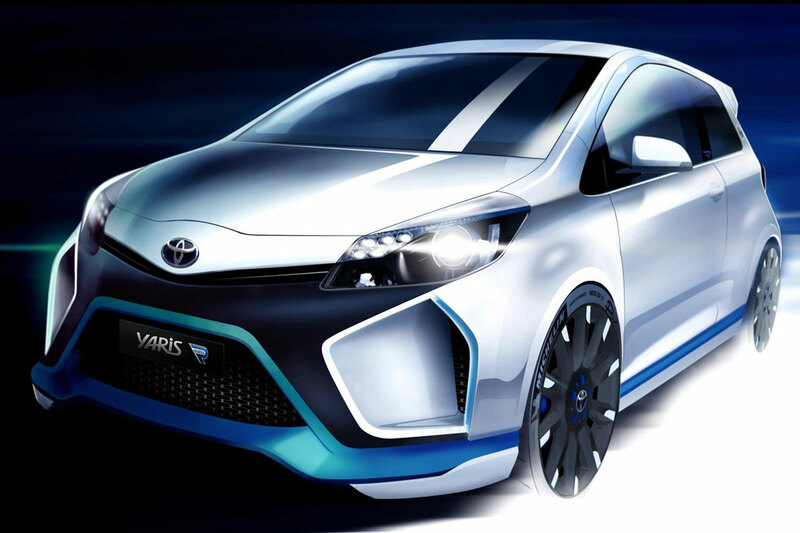 The Toyota Yaris Hybrid-R Concept will bow at the upcoming Frankfurt Auto Show. So what makes it so special? How about the fact it makes 414 hp using a gasoline hybrid engine? The powerplant will be a 1.6-liter gasoline mill with a supercapacitor developed for the Toyota TS030 Hybrid Le Mans car. Oh, and it'll have three electric motors! Two of those will drive the rear wheels; the third is between the sequential gearbox and engine. This should be a pretty radical subcompact. Dare I say a Subcompact Supercar? Likely just a showpiece, I do wonder if somehow Toyota plans to inject a little more spark (sorry for the pun) into the Yaris by adding some sort of performance hybrid drivetrain? Likely not, but this car is going to be pretty neat. In designing Yaris Hybrid-R, Toyota has created a supermini concept like no other. Based on a reworked three-door production model, Yaris Hybrid-R harnesses Toyota's race-winning sports hybrid technology in a powertrain that develops more than 400bhp. The concept will appear for the first time at the Frankfurt motor show next month, but ahead of the unveiling, Toyota has released more details about its special engineering qualities. In simple terms, the powertrain features a 1.6-litre petrol Global Race Engine and two powerful electric motors that give the car intelligent electric all-wheel drive. It also makes use of a supercapacitor to harvest and store energy, just like Toyota's TS030 Hybrid Le Mans car. In combination, the elements in the hybrid powertrain produce maximum power of up to 414bhp (309kW). The two electric motors work as electric generators when the car is braking, and supplement the petrol engine's performance under acceleration. The level of power depends on the duration of energy delivery required. So, when Yaris Hybrid-R is running in "road" mode, the supercapacitor releases energy for a maximum 10 seconds per charge, and the total power of the two electric motors is reduced to 40bhp. In "track" mode, the motors reach a combined maximum of 119bhp for up to five seconds per charge, reflecting the more frequent braking and acceleration in circuit driving. The latter only happens when engine power and torque exceed the front wheels' grip limit. The generator works like an advanced traction control system, redirecting torque as electric energy to the rear wheels, to boost acceleration and improve handling rather than simply to limit engine power. The rear electric motors can have a big influence on Yaris Hybrid-R's handling when cornering, by altering the torque distribution between the left and right rear wheels.